When it comes to winter jackets, the options available are numerous. From lightweight ones, to parkas that will keep you warm in freezing weather, the choices are many and sometimes a tad too much. Regardless of style, cut or design, a proper winter jacket that is meant to provide warmth will almost always be an insulated one. And while there are several materials that provide considerable insulation, jackets that are padded are either insulated with Down or with another synthetic type of insulator. In some of our past articles we have looked at down versus the most renowned synthetic insulator, PrimaLoft, and have also seen whether a down-insulated jacket is better than one insulated with synthetic padding. Today we will be looking at another really well-known synthetic insulator, ThermoBall by The North Face, and see how it differs from real down, as well as how it compares to it. ThermoBall™ is a polyester alternative to down, made by The North Face in partnership with PrimaLoft®. The North Face is a recurring brand here on our site and many of you are already familiar with the name and might even own a product of theirs. PrimaLoft is the synthetic insulator which revolutionized the down-alternative jackets and garments due to its redesigning of the typical shape and material that was used until then for synthetic insulators. The very fine microfiber filaments of the original PrimaLoft insulation provide a much better heat-trapping ability than other insulators and it’s for that reason that it is regarded as the closest down-mimicking insulator. 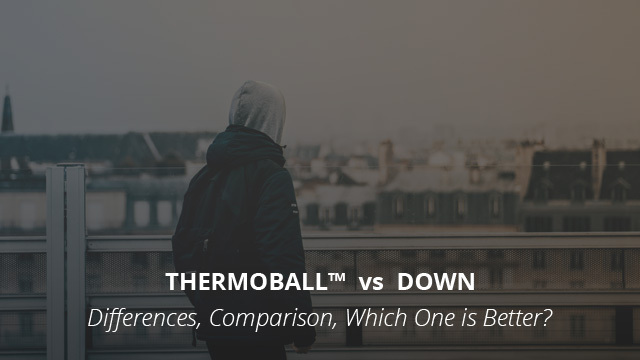 But what is so different about ThermoBall in comparison to other synthetic insulators? It all comes down to its shape. While most synthetic insulation is formed in flat rolls of different sizes and lengths, ThermoBall’s shape is made to mimic down clusters. This shape gives ThermoBall the ability to trap more warmth and also compress better than most synthetic insulation. Due to its ball-like shape, it was also found in an independent study by the University of Kansas, that the ThermoBall insulation is equivalent to 600-fill power goose down, which is considerably more than other synthetic insulators. ThermoBall was found to be 10% better than the original PrimaLoft insulation, which, as we mentioned, was shaped as tiny filaments rather than the clusters of ThermoBall. Being made of polyester, ThermoBall shares a similarity to other synthetic insulators of its kind, which is that of being able to insulate even when wet. This is a very important quality as it is one of the reasons why synthetic insulators were developed to begin with. Regardless of how water-resistant or waterproof an insulated jacket, sleeping bag or any other garment is, the risk of it wetting out is always there and ensuring that the jacket will still manage to keep you warm even if it gets wet is essential when you are faced with freezing temperatures. ThermoBall is also a very lightweight insulator, making it able to compress better and also feel more comfortable without adding extra weight to your overall attire. Its ability to compress makes many of the ThermoBall jackets by The North Face able to pack into their pockets. This makes them very practical to take with you while travelling or as a backup out on the trail. Down is revered as being the best insulator there is due to its very light weight, its ability to trap great amounts of heat in-between its clusters and also for its compressibility. There are other natural insulators that perform quite well overall, such as wool, but nothing can even come close to down’s ability to insulate. When saying down insulation, what it means is only the fact that it is down, but it does not say much about its qualities. Down is sourced from two different waterfowl: ducks and geese. In itself, down is the undercoating that helps these birds maintain body heat when the temperatures drop and when they are in the water. In regards to the difference between the two, there are a couple that bear mentioning. Goose down, for one, is far more expensive than duck down, due to its higher loft and better overall performance when the two are of equal fill power. Fill power is the rating of down which refers to the volume that one ounce of down can fill when expanded. The higher the fill power, the loftier the down and the less amount is required to provide insulation. As for sourcing, many major brands that use down in their products meet the RDS or other similar standards, which ensure that the sourcing is ethical and from farmers that treat the birds humanely, do not live-pluck or force-feed them and which are a byproduct of the meat industry rather than being raised solely for down-sourcing. For those of you who are familiar with down’s major downside, that of losing its ability to insulate when wet, it might seem strange that down is such a good insulator for those birds who spend a lot of their lives in water. The reason for that is preening, which is the spreading of oil from the oil gland to the surface of the feathers, making it impossible for water to pass through the oily feather, thus keeping the warm undercoating warm and fluffy. We cannot possibly douse our jackets in oil, obviously. That’s where down water-repellent products come into play, such as Down Defender. Another way is that of making the shell lining of the garment waterproof or water-resistant in order to minimize the risk of down getting wet. Unfortunately, there is no 100% guarantee that water won’t make it through and that down won’t get wet. When wet, down clusters tend to bind together and flatten out, losing their loft, which is their fluffiness per se, and therefore losing the ability to trap body heat. 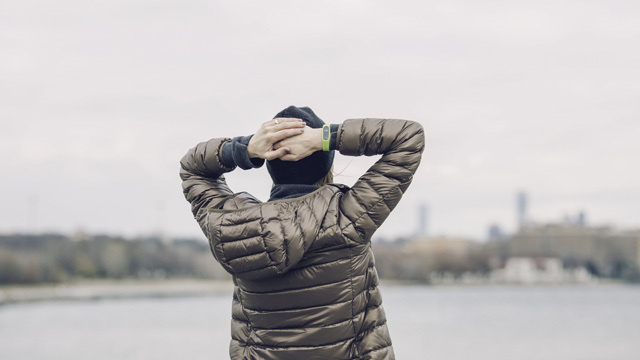 This is not solely a nuisance, but it can be very dangerous considering that if you are wearing a down jacket, the temperatures outside are really low, putting you at risk for hypothermia. It’s because of this issue that down jackets are best suited for those who live in cold and dry areas where it rains very rarely. While overall these two insulators perform at high levels, there are certain differences to be mentioned. ThermoBall is an already-commendable synthetic insulator that, with its cluster-like design, is capable of trapping great amounts of body heat. However, as good as it is, no synthetic insulator can outdo natural down. With its many tiny air pockets it manages to trap heat unlike any other insulator available. Here we will go with ThermoBall. Even if the garment itself is waterproof and even if Down Defender or similar water-repellent products were used on the down, there is a risk that it might wet out and thus lose its abilities. This is a non-issue with ThermoBall which, even when wet, will provide adequate insulation and will dry much faster. Polyester insulators have come a long way, and ThermoBall, much like the other products by The North Face, has commendable durability and will last for several seasons. However, excluding factors like care and maintenance, down in itself is extremely durable and will last longer than any synthetic insulator. Look at jackets by Canada Goose or other similar brands, which can last for decades. While the huge plus of ThermoBall is that of insulating when wet, its ease to care for and maintain is also a great quality. Down is notorious for being bothersome to maintain and clean, as it requires several steps and measures taken in ensuring that the cleaning process is successful and that the garment makes it out unscathed. We have compiled a guide on properly cleaning a down jacket, which makes it a bit easier. It also takes longer to dry and requires additional steps even in this regard. ThermoBall jackets on the other hand, are very easy to clean as they require regular washing and the clusters of insulation do not tend to stick together when wet, which is not only a big difference from down, but also from many other insulators. Overall, down is a better insulator in regards to retaining body warmth and it is also really lightweight, highly compressible and very durable. On the other hand, ThermoBall is more versatile as it withstands different types of weather, while at the same time being really easy to care for and is also quite durable. Depends on where you live, in our opinion. We said the same thing when we compared PrimaLoft to Down, which is that if you live in areas with harsh, cold and dry winters, down is the better of the two insulators. But if it is cold and it rains or snows heavily, then ThermoBall will provide great insulation both dry and wet.